Managing the daily life of a Performing Arts Center is hard for many reasons. One major complicator is the fact that we constantly work with people and organizations from outside the walls of our building. Artists, rental clients, external vendors, part-time staff, and designers all have their own systems of working. We have little to no time together before we hit the ground running. It’s easy to overlook the added complexity this brings to everyone involved. Let’s take a moment to reflect on these ramifications and figure out what we can do to ease the frustration. What is it like in other industries? In a traditional, large corporation you share a big office with hundreds of other people. You spend the vast majority of your time working with them. Everyone will have gone through the same onboarding and use the same internal systems. It won’t be perfect, but you’ll at least have developed a common set of working parameters, workflows, and tools that dictate how information is collected, organized, and communicated. 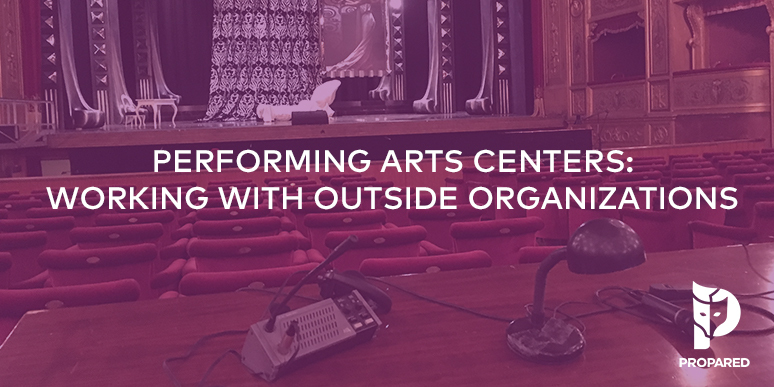 How are Performing Arts Centers different? Unlike the above example, the work we do as production managers or operations managers necessitates collaboration with people that do not use the same workflows and tools. This disconnect creates a cycle of translating of information from one format to another and then back again, opening up the possibility for miscommunication, confusion, and errors. Any time you’re presenting other works, renting out your space, or working with multiple school departments this reality must be accounted for in your organization and communication workflows. How do we currently handle this challenge? Having spoken with literally hundreds of production managers and operations managers over the past few years, I can confidently report, that 99% of us struggle to take outside organizations into account in our workflow. And we all know where it ultimately leads to: PDF after PDF being dumped on our collaborators and colleagues. This has some real ramifications! We waste valuable time: It’s ridiculously time consuming to format, export, attach, and send a PDF every time something changes. Think about how much time you waste in that vicious cycle every week. Think about how much time your colleagues must spend sifting through their emails and file folders. It’s easy to make mistakes: With all these schedules flying around, someone is bound to slip up. Either you’ll forget to update that one schedule or they’ll read the wrong version. These mistakes often have significant financial implications. Stop making copies! To reduce the likelihood of a mixup, everyone must see the same information. Not identical copies. The SAME information. This eliminates any confusion about what your team should be looking at. If it’s wrong, at least you’re all wrong together! Centralize information. Create a single, centralized location for all schedule and logistics information. That way there’s only one source to reference and we can eliminate the PDF cycle of death. Plus, you’ll only have to update something once and have it change in all the right places instantly. This will save you massive amounts of time. Communicate in ways that make sense to others. It’s difficult if not downright impossible to get people outside your organization to adjust their workflow just to make your life easier. Everyone is busy and we must communicate in ways that don’t require others to take additional steps to get what they need. Integrating with programs and workflows that they already use (like calendars and web browsers) means you might actually get people to see what they need.